Temba Bavuma may get an extended run top of the order or can be replaced by T20 specialist Sarel Erwee or Morne Van Wyk. DUR vs JOZ Playing 11 Here’s how both teams’ might line-up for tomorrow’s encounter:- DUR:Hashim Amla, Temba Bavuma/Sarel Erwee/Morne Van Wyk, David Miller, H Klassen (wk), Khaya Zondo, Albie Morkel (c), Vernon Philander, Keshav Maharaj, B Mavuta, Kyle Abbott, Marchant de Lange. JOZ:Ryan Rickelton, Reeza Hendricks,Rassie Van Der Dussen, Dane Vilas (c and wk), Petrus Van Biljon, Daniel Christian, S Harmer, Dwaine Pretorius, K Rabada, Beuran Hendricks, Duanne Olivier/Eddie Leie. DUR vs JOZ Dream11 Team*B Hendricks in bowling is risky, as he has leaked too many runs. But i am taking risk. *For safe pick, go for Maharaj or Rickleton in place of B Hendricks. Pacer Amir Hayat can replace Zahoor Khan. Chances of same are less. Being last league match, Adam Lyth can get a chance resting any player. Hazratullah Zazai, Alex Hales, N Zadran, K Akmal, B Taylor (wk), Rashid Khan, Dwayne Bravo (c), James Faulkner, Roelof van der Merwe, Zahoor Khan/Amir Hayat, R Gleeson. SIN vs MAR Dream11 Team Visit before 1 Hour of the deadline. Maybe some changes here. Stay connected for more HB-W vs PS-W team news. Georgia Redmayne (wk), Hayley Matthews, Corinne Hall, Sasha Moloney (C), Stefanie Daffara, Erin Fazackerley, Rhiann O’Donnell/Meg Phillips, Veronica Pyke, Alex Hartley, Brooke Hepburn, Katelyn Fryett. PS-W: Nicole Bolton, Elyse Villani, Meg Lanning (c), Heather Graham, Lauren Ebsary, Megan Banting/Mathilda Carmichael, Emily Smith (wk), Kate Cross, Taneale Peschel/Bhavisha Devchand, Emma King, Hayleigh Brennan. 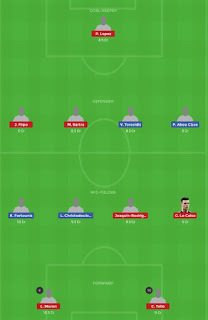 HB-W vs PS-W Dream11 Team: *Watch Video for more Info. Among raiders you can pick Naveen Kumar as he has been the leading scorer for the team of Dabang Delhi KC. He has scored 107 points in 13 matches. Ranjit has also been a leading raider for the side of the Dabang Delhi. He has scored 89 points in 13 matches. Among all-rounders you can pick Deepak Niwas Hooda and Meraj Sheykh.Deepak Niwas Hooda has scored 103 points in 12 matches and he is one of the most successful all-rounders of the tournament. Among defenders, Ravinder Pahal, Joginder Narwal and Sunil Siddhagavali can be picked. Dabang Delhi have a strong defence department and Ravinde Pahal is leading the way. He is a must pick for you fantasy team. RAJ VS NOR TEAM NEWS:In form batsman Laurie Evans if fit can come in place of Ben Dunk for today’s crucial encounter. Harry Gurney can get a chance in place of Wahab Riaz. Chances of same are less. RAJ VS NOR PLAYING 11:Rajputs Playing 11: Mohammad Shahzad (wk), Rilee Rossouw, Ben Dunk / Laurie Evans, Brendon McCullum (c), Carlos Brathwaite, Peter Trego, Rohan Mustafa, Qais Ahmed, Tymal Mills, Munaf Patel, Sayed Shirzad. Lendl Simmons, Nicholas Pooran (wk), Andre Russell, Rovman Powell, Kennar Lewis, Ravi Bopara, Darren Sammy (c), C Green, Wahab Riaz/Harry Gurney, Hardus Viljoen, Imran Haider. RAJ VS NOR DREAM11 TEAMI will play with Risky Team with less investment, you can select as per your choice. Rajputs fantasy picks: Skipper Brendon McCullum (135 runs at SR of 180) has led from the front so far. Mohammad Shahzad, Carlos Brathwaite and Munaf Patel are among others who have had good outings in the recent games. Jason Roy is not available as he is playing in T10 league. KERALA vs BENGAL DREAM11 TEAM PREDICTION🏟 Venue:- Sharjah Cricket Association Stadium. KER vs BEN Team News Bengal Tigers: Morne Morkel can be replaced by Zaheer Khan or Ali Khan. Chances of Zaheer are more. Kevon Cooper can also be replaced by Rayad Emrit. ℹ Short Info: Jason Roy and Sunil Narine will open the innings. Luke Wright, Sherfane Rutherford and Sam Billings will follow them. Mohammad Nabi, Narine and Aamer Yamin will be the all-rounders. Mohammad Nabi and Mujeeb ur Rahman will be the key spinners along with Sunil Narine while Aamer Yamin will lead the pace attack.